Beautiful engraved wooden pens. A perfect gift for any recipient! The item for sale is for one pen with YOUR NAME or message- professional laser engraving is included in your purchase. 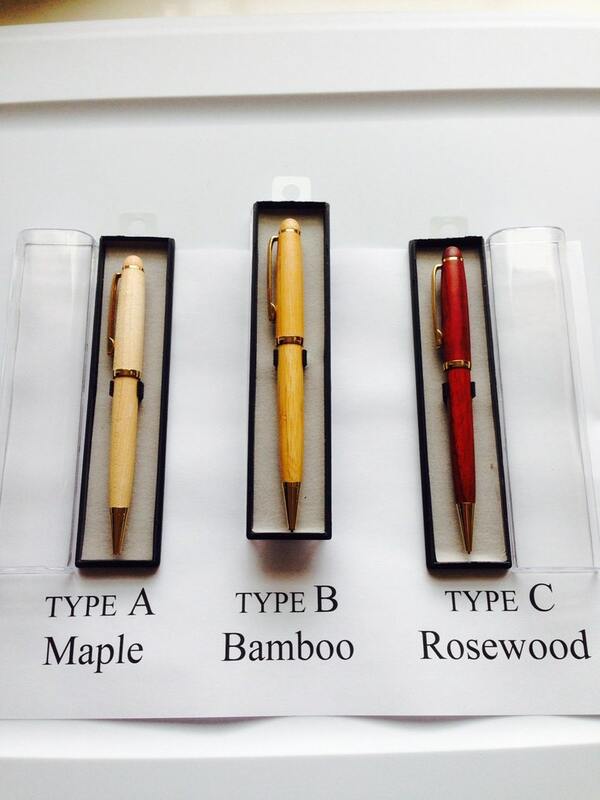 Three styles to choose from - Maple, Bamboo, or Rosewood. The pen is 5.5 inches long, has gold trim and twists to open. As a free gift, each pen includes a black felt holder. For $2 more you can add a clear, acrylic display case with a felt liner and cardboard sleeve. The pen writes in black ink. Step 1: Select the type of wood, and the font you would like. Step 2: Enter the name(s) you need in the personalization box. This was a rush order and it was done beautifully and ahead of time. Doug is super responsive, helpful, and a joy to work with. I can't say enough great things about him, his craftsmanship, and his customer support! Beautiful work! Shipped the same day. This item shipped hours after I ordered it! Beautiful pen and engraving is perfect! Thank you so much - I'm sure I will be back for more!! Payment is due upon purchase via credit card or Paypal. Paypal Invoices can be sent upon request. Refunds are issued if we are responsible for an error or if an order is cancelled immediately after a purchase. Due to the permanent nature of engraving, exchanges can not be honored as we can not "redo" an item once it has been engraved. Shipping is done using USPS services which include: First Class, Priority and Priority Express. Unique Baseball Bat Pen - Engraved with YOUR NAME, TEAM, website etc. Personalized Office Set - Pen, Letter Opener and matching wood case. Double Pen Office Set. Rosewood pens (2) and matching display case. Design a Knife - Custom Knife / Personal Keepsake - Choice 20 bucks! Beautiful Knives!